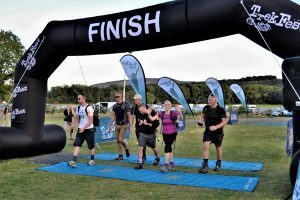 When the team at Virtue Technologies committed to fundraising for us as their chosen charity throughout 2018 they would have had little idea of the events they would get involved in or the fun they would have! Virtue Technologies is a leading provider of IT solutions to Primary and Secondary schools, Academies and Multi-Academy Trusts & FE colleges. The team based in Skelmersdale, Lancashire raised an amazing £2072 during 2018 to support us in delivering care and support to people with a life limiting illness and their families in West Cumbria. 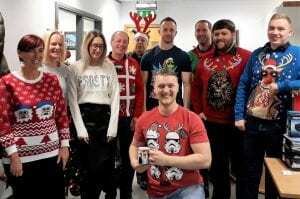 Lindsey Widdowson, Management Accountant from Virtue Technologies said: ” We did a variety of things in the office – we held cake bakes and bacon butty mornings, hot pot lunches, Christmas jumper day and a raffle we did for Christmas also raised quite a lot of the money; then of course there was Trek Fest. We would like to thank all the staff at Virtue Technologies for their support. 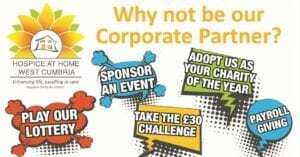 If you would like to become a a charity partner or work with us as a corporate sponsor we’d love to hear from you.